I say ‘cloaked’ because street epistemologists are advised not to reveal their atheism during the intervention with a theist. They are also told that what they will be doing through the ‘intervention’ will be a great ‘help’ to the ‘delusional’ theist. Let’s take a closer look at how street epistemologists are using their techniques for talking people out of their faith and read some examples. Street epistemologists are taught to target the ‘foundation’ of theism – ‘faith.’ Boghossian believes while other atheist leaders have done a good job ‘exposing the fraudulent nature and dangers of religion,’ it’s now time to move the conversation forward by ‘refocusing our attacks primarily on faith.’ He advocates and trains street epistemologists to ‘target faith, not religion’ during their interventions. Boghossian also trains street epistemologists not to target ‘God.’ That may sound a bit strange coming from an atheist, but here’s his reasoning. “Hello Mark, I must admit I’m having trouble deciphering what you’re saying here. On the one hand you say that you are continually searching for truth, yet on the other you claim to have found it in Jesus. I may be mistaken, but have never met someone who says that they’ve found something who is continuing to look for it. Please explain. Also, I’m not asking that you pretend not to know something you feel you know, only that you agree that it’s possible to be mistaken about something one thinks one knows. In the absence of a response to my previous question about the fallible nature of human beings, I’ll assume your answer to be sunshine and proceed accordingly. Assuming that humans are by their very nature fallible and imperfect, how might you go about determining if you were mistaken? “This is an interesting question Mark. How does a person determine that their faith is not another part of their inherent fallibility? You have stated that we need systems to help us overcome fallibility, how effective might faith be at performing this function?Are not millions of people using it to reach very different conclusions? If you were mistaken In believing in God as a result of the human fallibility that you and I have agreed is inherent, how would you go about discovering this? I call that justified belief…I can’t justify throwing evidence in there because it weakens the argument. So, if you did have evidence that would prove the existence of God, to everyone on earth, without having to believe first, that would be AMAZING. Don’t you think so? If not, you don’t think God is as important as I do. His existence would change the world. You couldn’t keep it to yourself. Now, lets also assume, God was Jesus. Everyone else that doesn’t believe in him is wrong, and you need to have the most powerful nation on earth come together to show the world that we are correct. “Here is the evidence” we would all say. They might not come willingly, but through the scripture and evidence based epistemology, they really wouldn’t have a choice in what is true. We would know true things, and just try to show them. Also, WE WOULDN’T NEED FAITH. You might scream “HALLELUJAH” and I might too. “I have another comment to add. I do not argue that there might be a God that is both spaceless and timeless. If there is this God, what is the evidence that you claim to know that the God of the bible is true and not one of the thousands of other gods throughout history. Secondly, how is consistent accounts in the bible different from historical accounts in any other sacred text. Christianity claims to be the one true religion, but so does every other religion. Homer’s Iliad and Odyssey supports historical facts, but we aren’t searching for a petrified Medusa, mermaids, or praying to Zeus. I would venture that the belief in Christianity comes from the claim that Jesus existed, did miracles and was resurrected. The problem I have is that it has as much believability as the accounts of Muhammad and the winged horse, or Joseph Smith’s golden tablets. each of these examples are INTERNALLY coherent, in that they can explain themselves within the belief system, however, their foundation rests on faith (belief without evidence). “Imagine being ready to start from” I don’t know” at any given time. This is what is required by the scientific method. At any given time something we consider fact could be disproved and we would have to start over from square one. Would you be willing to explore this state of being with me? I have a proposition for you that I wonder if you might find interest in. Could we both start from the same place in the search of truth? Might we both start by saying “I don’t know” and see what we discover? I will say “I don’t know that God doesn’t exist” and you say “I don’t know that God exists” and we’ll go where the evidence leads us. “What if I told you that one moment of reason makes me happier than ten years of prayer, bible study, mission work and seeking God’s will ever could? Every Christian should be prepared to answer the objections of non-believers (Acts 22:1; Philippians 1:17; 1 Peter 3:15). Our responses will come from personal knowledge, understanding and experience acquired through study and practice, as well as our relationship with God through worship, prayer and obedience. Because our knowledge, understanding and experience are unique to each one of us, our answers will also be unique. Please keep that in mind as I share some of my answers to objections. Think about how you might respond to similar objections in your own unique way. “Discovering truth in Jesus Christ doesn’t mean the ‘truth’ journey is finished. In fact, it’s just begun. Example: as children we learn the ‘truth’ about the number 1. 1 apple, 1 mother, 1 father, 1 sister, 1 house, 1 car, etc. We learn that adding two 1’s together (1+1) gives us 2 things (1+1=2). We learn another truth that if you have 2 things and remove 1 of the things (2-1), you are left with 1 thing. The number 1 is foundational to adding and subtracting. Denial of the number 1 will not help us better understand numbers since it is the foundation of the numerical system. Believing that Jesus Christ is ‘truth’ is the foundation of spiritual knowledge. Denial of Jesus Christ will not help us better understand the spiritual world since He is the foundation of the spiritual world. Even as I would not deny the number 1 being necessary to an understanding of numbers, I would not deny Jesus Christ as being necessary to an understanding of truth. Having been an atheist, I understand how that sounds to atheists and why we often have difficulty finding common ground to discuss what is true. “I used the math example as a demonstration of how we build on truth discovered. Once I know about the number 1 being part of the foundational structure of addition and subtraction, I don’t need to regularly return to that truth to determine whether it is still true. Once we know that Jesus Christ rose from the dead, we don’t need to regularly return to that truth to determine whether it is still true. If two different people are using the ‘same’ method of adding one plus one, how would they come up with two different answers? I would think that one of them was using a ‘different’ method or had ‘redefined’ the terminology. Please give me examples of different people using the ‘same’ method of ‘faith’ who are coming up with ‘very different’ results? I think what we’ll find is that the people used ‘different’ methods or ‘redefined’ terminology, but I’d like to see your examples to know for sure. You are reading the Bible correctly. That is what Jesus said. People who believe what Jesus claimed about Himself, that He is THE truth, are not searching for ‘another’ truth or a ‘different’ truth. Jesus is THE truth. Just like the math example of building numerical knowledge based on the foundation of the ‘number 1,’ people who believe Jesus Christ is THE truth build on that foundation to discover more about truth. If I want to know the answer to 50+50, I’m not turning my back on the foundation of the number 1. In fact, I’m using that foundation to help answer my question about 50+50. I believe ‘truth’ is a fixed place at which people can arrive. The number 1 is a foundational truth of mathematics. Jesus Christ is foundational truth of life. Both are truths in a ‘fixed’ place. We build on those foundations to learn more truth. People first must know that their system for discovering truth works (e.g. truth is discovered). If their system does not work, then they are wasting their time trying to discover truth. They need to analyze their system (systems analysis) to make sure their system works as intended. That means taking their system apart and putting it back together. It’s a basic principle of investigative journalism and many other disciplines. “I remember sitting at the large RCA console in the radio studio and telling my audience that I was going to challenge God to prove Himself to be real by sitting in a chair across from me and answer my questions. I waited several seconds (dead air on radio feels like forever), then told the audience that God had not shown up and that He must be on vacation or under the weather. I laughed and opened the phone lines to a mob of people who wanted to tell me I was going to burn in hell for what I had just done. What I didn’t expect was for God to send someone to be a guest on my show a year later who would begin the process of presenting evidence that would lead to my quest for the truth about the existence of God. I wish I still had a tape of that show and others I did as an atheist. I was skeptical during my investigation into the evidence for theism and Christianity because I didn’t believe in the supernatural. I looked at all the evidence I could find and asked every question I could think of to get to the truth, but I didn’t let go of my disbelief in the supernatural. That was my presupposition and as an investigative reporter I knew that presuppositions were dangerous to discovering the truth. I had to be open to the possibility that the supernatural existed. I didn’t believe it existed, so that was something I had to struggle with during the investigation. “The starting point for my belief was when all my questions were answered. I started months earlier from the position of ‘I don’t believe.’ It later became ‘I don’t know’ or ‘I’m not sure’ as my investigation continued. One of the people to whom I asked many questions about evidence asked me if there was any ‘reason’ why I shouldn’t believe in Jesus Christ. I thought about that for a bit and realized I could not think of any ‘reason’ not to do just that. The answers I had received to my investigative questions were reasonable and that started my trust in the evidence I had seen. “I also have found happiness in the continual search for truth. However, my search is based on the Truth of Jesus Christ and not on something that is not known. Basing one’s life on truth creates an exciting foundation for discovering more truth at a deeper level. As Jesus said, ‘you will know the truth and the truth will set you free.’ I have found great freedom in knowing the truth. It has opened a vast gold mine of knowledge and wisdom to investigate. As the Bible says, ‘Faith comes by hearing and hearing by the word of God.’ The combination of ‘deep diving’ the well of God’s Word and investigating the life we are living is a wonderful classroom and laboratory. 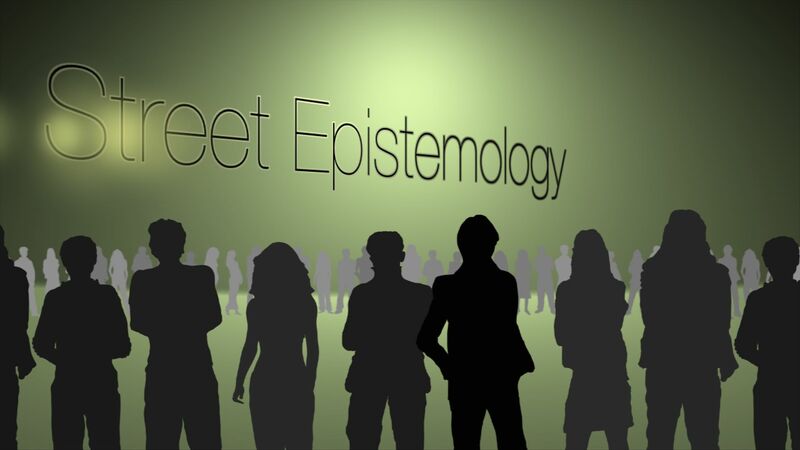 What are your thoughts about the methods and techniques of street epistemologists? Are you and your children prepared to counter their ‘intervention?’ If not, then let’s keep training.